Blacksod Lighthouse was built in 1866 and is located near Termon pier at Blacksod on the northwest coast of Co Mayo. It was built in its entirety from red granite sourced locally and is only one of two lighthouses in the world of square construction. 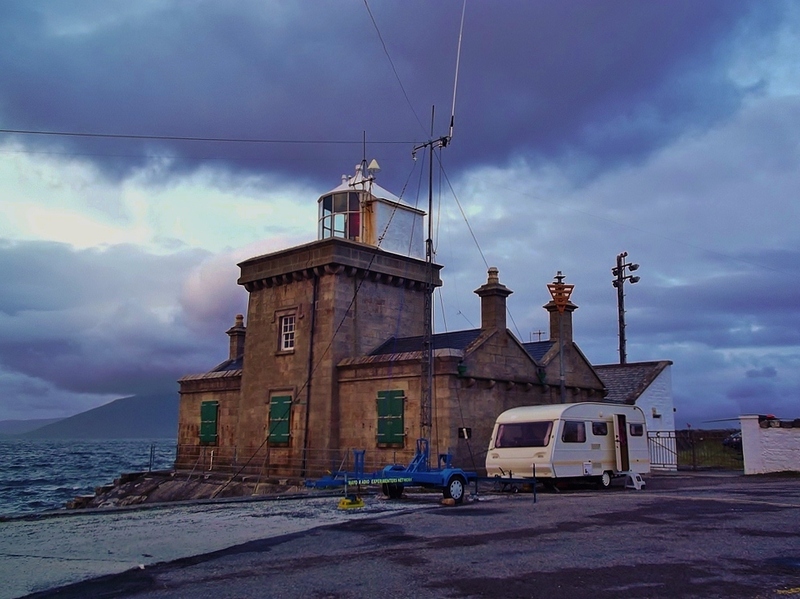 The location of Blacksod Lighthouse is 54° 05’ 09” N, 10º 03’ 06” W. The Lighthouse is now automated and is maintained by Vincent Sweeney who also oversees the maintenance of Eagle Island lighthouse and others in the locality. 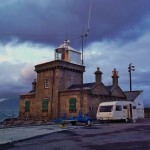 In 1969, Blacksod became the helicopter base for the service crews and also a helipad for the rescue helicopter. Blacksod became famous in 1944 where the weather report, given by Ted Sweeney, from the Lighthouse on the 4th of June influenced deferral of Operation Overlord, the D Day invasion of Normandy until June the 6th. A small window of five days was deemed suitable for the invasion due to the spring tide and position of moon in the sky. The weather report indicated an active cold front was due over the battle area bringing strong winds and rain and therefore the invasion was re-scheduled for 6th of June. The 18th and 19th of August was designated as International Lighthouse and Lightships on the air weekend. The basic objective of the event is to promote public awareness of lighthouses and lightships and their need for preservation and restoration, and at the same time to promote amateur radio and to foster International goodwill. Lighthouses are fast becoming an endangered species with the introduction of Global Positioning Systems and Satellite Navigation and the automation of the light source to solar power which has resulted in the withdrawal of management personnel (Keepers). It is hoped that this event will highlight this situation and help prevent further desecration of these magnificent structures all around the world. 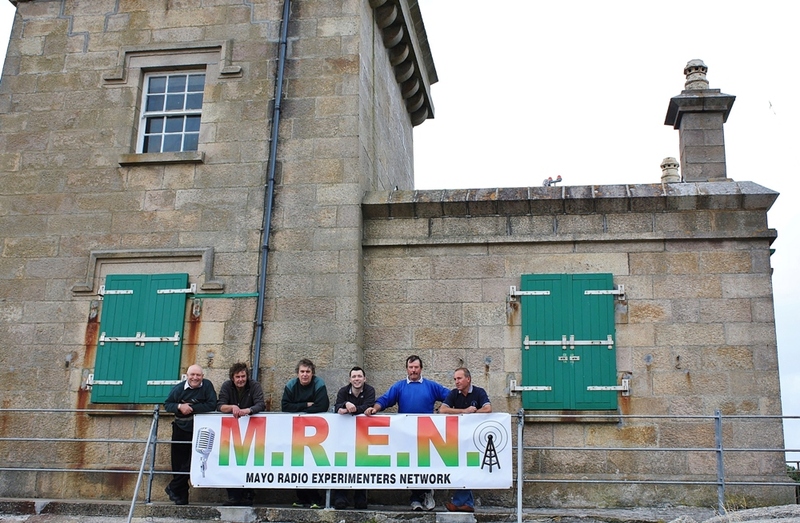 Members of the Mayo Radio Experimenter’s Network had recently been fitting out and preparing their newly acquired caravan for the Lighthouses On the Air operation. There was a provision for two comfortable operating positions and seating for loggers. All feeders and power leads were well installed with no trailing leads. Power, on this occasion, was derived from the lighthouse but generators were on hand if necessary. 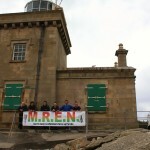 The Callsign EI0M was the callsign used on this occasion and the international designator for Blacksod Lighthouse was IE0008. The caravan and antenna mast on trailer arrived at Blacksod Lighthouse at 15:00 along with Padraic Baynes, EI9JA, Dominick Curtin EI9JS, Jimmy Kelly EI2GCB and Steve Wright EI5DD. After parking the Caravan in a sheltered area next to the lighthouse, the antennas were prepared for fitting to the tower. A multi-band Doublet and a Windom antenna were laid out and attached to the top of the tower. A vertical antenna for 20 -10 metres was attached also. The stabilisers were installed and the tower was ready for winding up to the desired height. Two stabilising guys were also attached as there was quite a fierce Atlantic weather front predicted later in the day. Raising the mast was a simple chore and, because the antennas were laid out neatly beforehand, there were no tangles. The ends of the wire antennas were secured to convenient anchor points and then the guys were tied off. All coax feeders were connected to sockets on the outside of the caravan. Inside the coax leads were distributed to the relevant operating positions. The ribbon feeder from the doublet was slipped in through one of the windows. 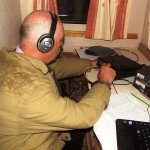 Whilst the antennas were being organised, the equipment was installed in the operating positions inside the caravan by Dominic and Jimmy. An Icom 7200 was used for the LF bands and a Yaesu FT897 was used for the HF bands. The antennas were distributed inside the caravan via a panel bringing in the feeders from outside. Everything seemed to fit together as planned and there were no technical hitches during the process. Headset/microphones were used at both operating positions with an optional speaker attached also. With all equipment checked the operation was ready to roll. 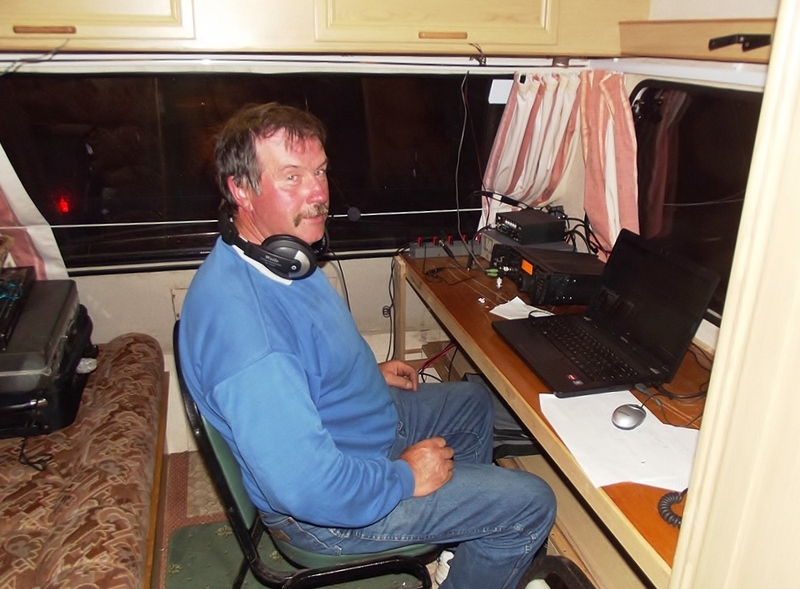 Padraic, EI9JA, was first in the hot seat on the 40 metre band, with Jimmy, EI2GCB, on the 20 and 17 metre bands. It was apparent that Solar conditions were going to influence the activity over the weekend. A solar flare was definitely pulling down conditions during the afternoon. Despite the conditions, there was a steady stream of activity on 40 metres and the 20 and 17 metre bands were yielding plenty of European activity. 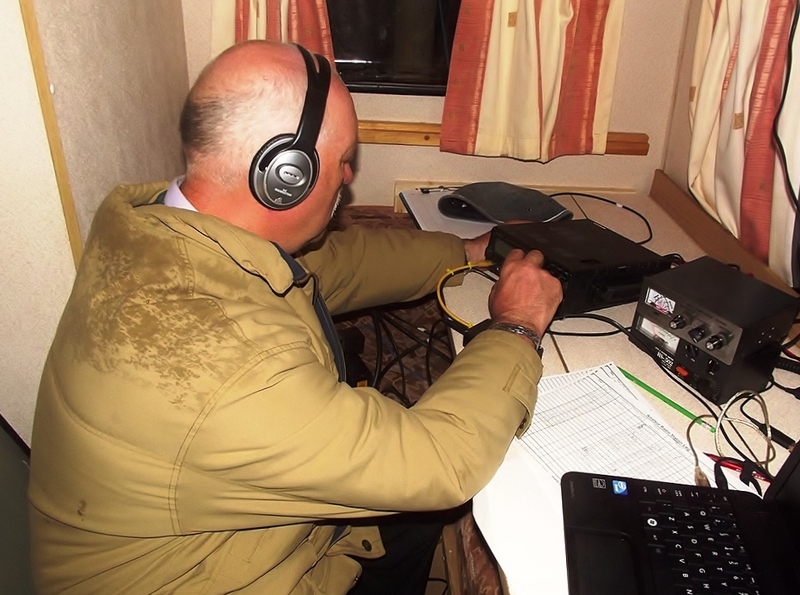 Padraic Jnr, EI5IX joined later in the evening and took over operation on the 40 metre band, whilst Padraic EI9JA took over on the 20 metre band. There was not too much crosstalk between stations during the operation provided the power levels were not turned up to high. Dominic kept an eye output of the transceivers to ensure that the signals were clean at all times and took steps to ensure minimal crosstalk between the two operating positions. Jimmy, EI2GCB produced an excellent feast from the barbecue. It was definitely well received as one tends to forget about eating when there is plenty of activity in the shack. The larder was well stocked so nobody went hungry throughout the event. Steve took over the operation of 40 metres and continued to operate the pile up that had been established during Padraic’s watch. The cluster system had obviously documented the location of Blacksod Lighthouse and lured more operators to our operating frequency. Europe was pounding in on 40 metres and the activity was non-stop. In the mean time the weather was taking a turn for the worse. The wind had picked up and rainfall was pretty heavy. The waves were pounding the side of the Lighthouse and one had to time the trip into the main building between wave hits otherwise one would be drenched from head to toe. Band conditions were really not opening too well so a 40 metre vertical was constructed and two of the radials were dipped into the sea favouring the westerly direction. It was hoped that the angle of radiation would be reduced resulting in an improvement in DX. On return to the shack the band was sounding auroral with the characteristic flutter on the 40 metre band. This was not a good sign and was heralding the demise of the bands in the early hours. Operation continued but the bands did finally die as predicted. 20 metres died around 1:30 am. 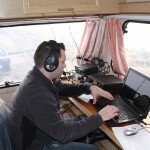 160 and 80 metres were tried but really did not yield much in the way of DX. 40 metres continued to yield European contacts. 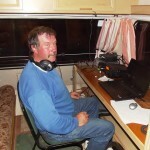 Padraic EI5IX took the opportunity to pound the brass and made a few CW contacts at this time. Operation eventually slowed down as the grey line passed Ireland giving an opportunity for rest and recuperation. 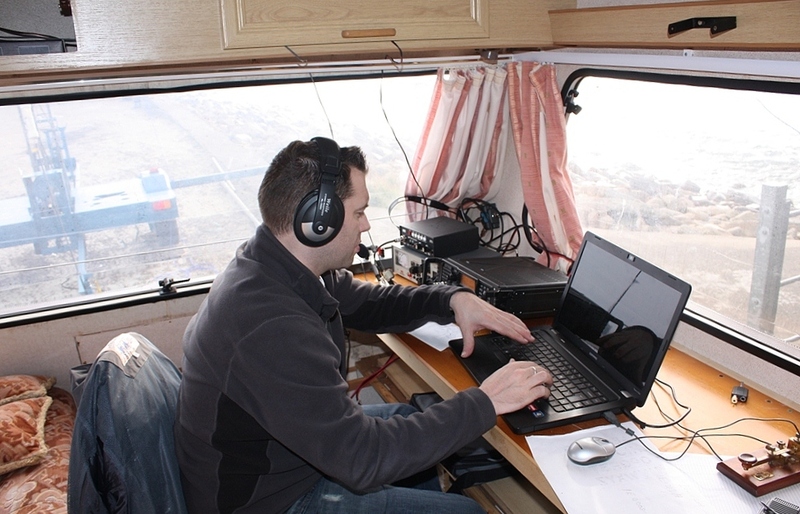 The 40 metre IRTS news came in well and reports were exchanged with Sean EI7CD. Following the news, time was devoted to working any EI’s who had called into the news. 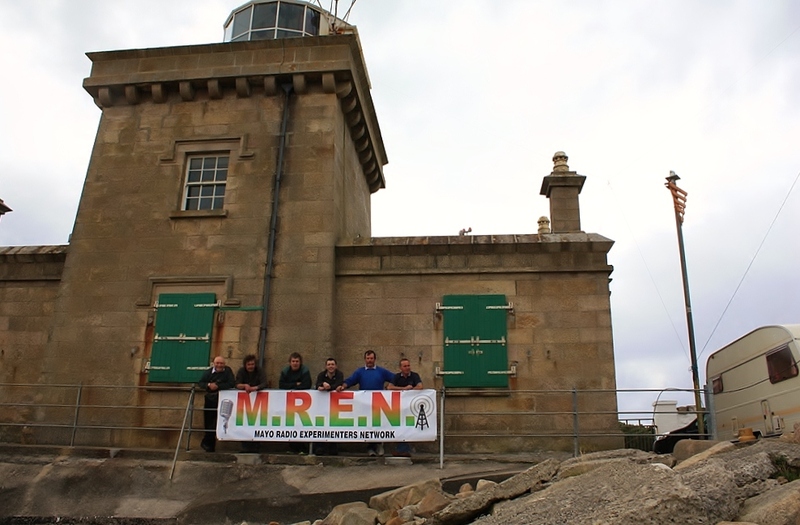 The 80 metre news was not as Strong but an exchange with Sean was successful and a QSY up the band resulted in a few EI contacts after which the station was re-tuned to the 40 metre band where activity continued until closure. 20 and 18 metres yielded a steady stream of contacts with Padraic and Jimmy taking turns at the operation. It was mainly European stations worked on these bands with many Lighthouses evident. Occasionally crosstalk was encountered by the 40 metre station but not enough to prevent operation. 40 metres continued to run a steady flow of stations. At 15:30 it was decided to dismantle the station. Padraic Jnr, Padraic Snr, and Steve worked on the antennas while Jimmy and Dominic dismantled the station in the caravan. It should be noted that care taken rolling up coax, ropes, and wire antennas makes a big difference to future operations. There is nothing worse than having to untangle wire and ropes at start of a future operation. With everything packed, a quick lunch was prepared before departure. Whilst band conditions were not wonderful, due to recent solar activity, it did not reduce the amount of activity on 40 and 20 metres. Approx 500 contacts & 50 countries, of which 30+ lighthouses/lightships worked, but mainly European and Scandinavian stations with a huge number of German stations apparent, we did work Argentina, Trinidad, Tobago, Uzbekistan, Kazakhstan and the USA and, as a bonus, Senegal appeared in the logs also. In conclusion the operation was a great success and the location was superb. There were plenty of visitors who showed an interest in our operation many of whom had never heard of Amateur Radio before. They were impressed! The caravan provided an excellent operating environment and only minor modifications have to be made before the next event. Special thanks to Vincent Sweeney, the Lighthouse Keeper, who was most accommodating. 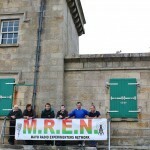 Vincent gave us the use of the facilities in the Lighthouse and he took a great interest in our operation. Special thanks also to Dianne Wright who, in the background, was taking video footage and pictures of the whole event with a view to a YouTube documentary and club video of the operation.